To familiarize the helicopter pilot/instructor and pilot school personnelof the hazards associated with dynamic rollover. An increasing percentage of helicopter accidents are being attributedto dynamic rollover, a phenomenon that will, without immediate correctiveaction, result in destruction of the helicopter and possible serious injury.This advisory circular informs helicopter flightcrews of the cause of helicopterdynamic rollover and measures to take to prevent such occurrences. When maneuvering with one skid/wheel on the ground, care must be takento keep the helicopter cyclic control properly trimmed (if equipped withforce trim/gradient), especially laterally. For example, if a slow takeoffis attempted and the tail rotor thrust contribution to rolling moment isnot trimmed out with the cyclic, the critical recovery angle may be exceededin less than 2 seconds. Control can be maintained if the pilot maintainsproper cyclic trim and by not allowing helicopter roll and pitch ratesto become too great. The pilot should fly the helicopter into the air smoothlykeeping excursions in pitch, roll, and yaw small and should not allow anyuntrimmed cyclic (force trim/gradient) pressures. 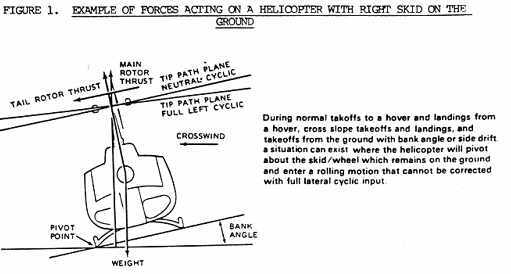 When performing normal takeoffs and landings on relatively level groundwith one skid/wheel on the ground with thrust (lift) approximately equalto the weight, the pilot should carefully maintain the helicopter positionrelative to the ground with the flight controls. Maneuvers should be performedsmoothly and the cyclic should be trimmed (force trim/gradient) so thatno pitch or roll movement rates build up, especially roll rate. If thebank angle starts to increase to an angle of approximately 5° to 8°and full corrective cyclic does not reduce the angle, the collective shouldbe reduced to diminish the unstable rolling condition. While this advisory circular primarily addresses the skid type helicopter,dynamic rollover can occur in either the skid or wheel equipped helicopter.All types of rotor systems, rigid, semirigid, or fully articulated areaffected to some extent. Tail rotor thrust and wind drag on the fuselagecontribute to roll moment. In helicopters that are equipped with main rotorsystems that turn clockwise (when viewed from above), tail rotor thrustwould be in the opposite direction and right pedal instead of left pedalcontrol would increase that thrust. a. Less lateral cyclic control will be available during crosswind operationswhen the wind is coming from the upslope direction. b. Tailwind conditions should be avoided when conducting slope operations. c. When the left skid/wheel is upslope, less lateral cyclic controlwill be available due to the translating tendency of the tail rotor. d. If passengers or cargo are loaded or unloaded, the lateral cyclicrequirement will change. If the helicopter utilizes interconnecting fuellines that would allow fuel to automatically transfer from one side ofthe helicopter to the other, the gravitational flow of fuel to the downslopetank could change the center of gravity, resulting in a different amountof cyclic control application to obtain the same lateral result. e. Care should be exercised so that the cyclic limits are not reached,resulting in mast bumping. If the cyclic control limit is reached, furtherlowering of the collective may cause mast bumping. If this occurs, thepilot should return to a hover and select a landing point with a lesserdegree of slope. f. During a takeoff from a slope, if the upslope skid/wheel starts toleave the ground before the downslope skid/wheel, the pilot should smoothlyand gently lower the collective and check to see if the downslope skid/wheelis caught on something. Under these conditions vertical ascent is the onlyacceptable method of liftoff. Dynamic rollover can occur on level surfaces as well. There are documentedreports that indicate a skid/wheel has been caught on a fixed object ofthe ramp, or stuck with ice or in soft asphalt, and resulted in rollover.Failing to remove a tiedown or skid securing device has caused dynamicrollover. 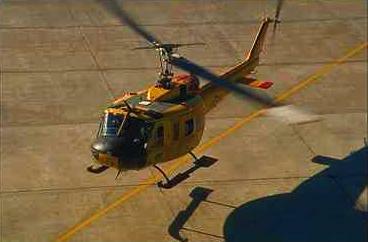 Reports have been submitted indicating the probable cause of accidentsinvolved flight operations of helicopters on a floating platform. If theplatform is pitching/rolling while attempting to land or takeoff, the resultcould be dynamic rollover.